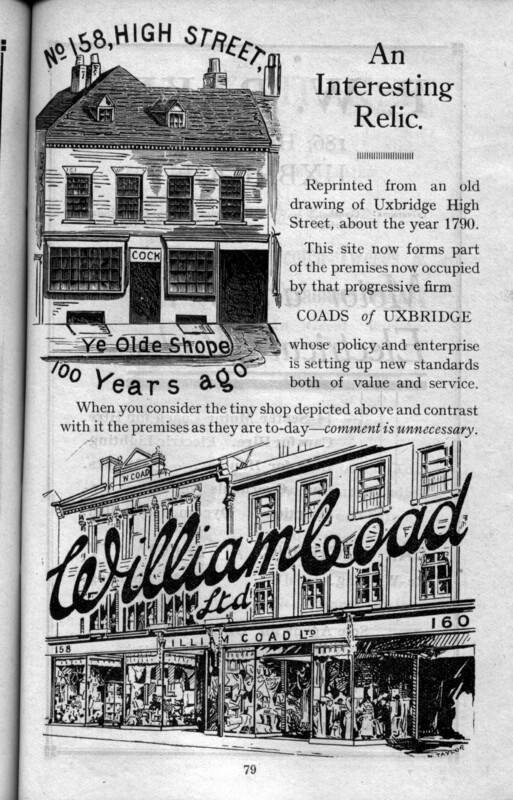 A motoring article in The Sunday Times of 21 March 1971 included a photo of Wilkinson's garage in Uxbridge in 1912 during the Challenge Tyre Co. tests. The cars in this special event were attracting a good deal of attention from those watching from upper windows in the High Street. 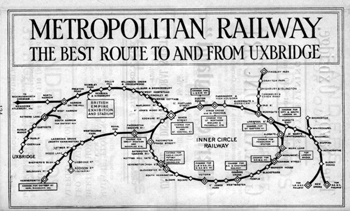 The Great Western Railway had plans to link the two branch lines which terminated at their Vine Street and High Street stations so as to provide a connection between West Drayton and Denham. The proposal was deferred on the outbreak of the Great War in 1914 and eventually abandoned. 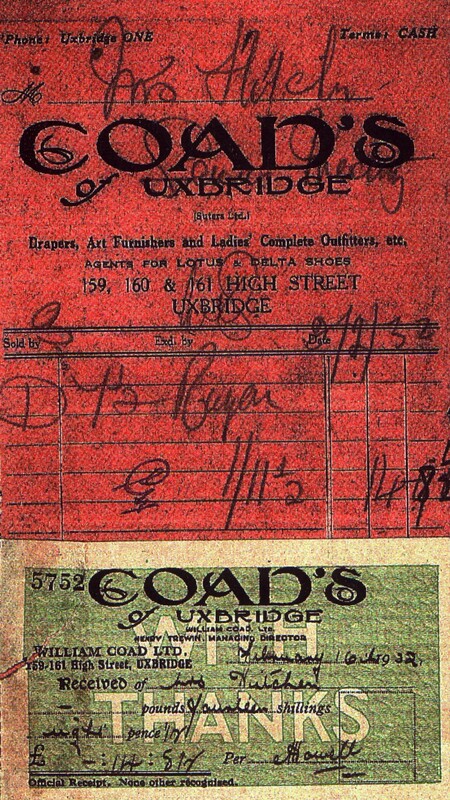 During the early years of the century Uxbridge began to re-generate. Some new industries such as the Steel Barrel Company, Bell Punch and Alfred Button set up in the town. There was also a growth of flower nurseries of which the largest had as many as 300 employees. 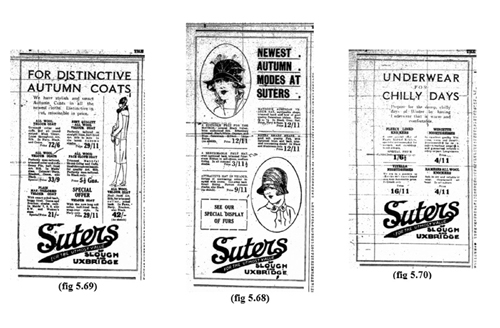 After the war Sandersons opened their wallpaper and fabric printing factory and there were changes in the High Street. A Woolworth's branch appeared and in 1921 the old Town Hall was transformed into a Cinema. 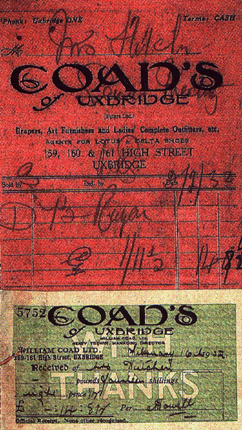 The same year a new Thames Valley Company bus service was introduced from Uxbridge to High Wycombe. 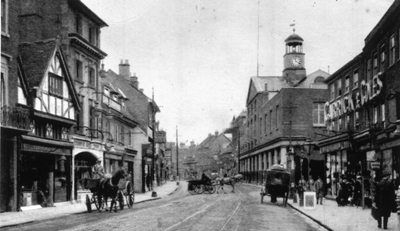 In the following year a bus garage for Uxbridge was opened to the west of the town just over the border in Denham. 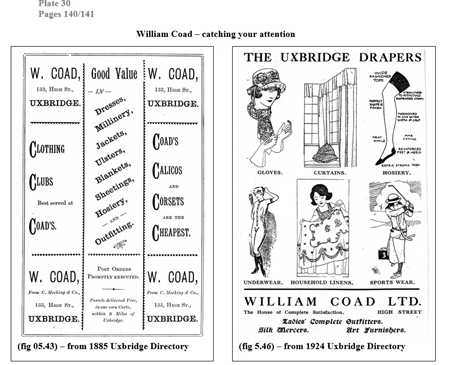 By 1924 Uxbridge was a town full of possibilities for an enterprising firm of drapers seeking somewhere to expand. Suter and Sons in Slough was such a firm and they entered into talks with the proprietors of the long established Carrick and Coles which had premises on a central corner site next to the Market House at the junction of High Street and Windsor Street. According to the Uxbridge History Society, in 1846, about ten years after the third George Suter had sold up his hat making, tanning and sack making businesses in Retford a man called Jessie Jones opened a small shop selling what may have been drapery 125 miles away at 31 High Street in Uxbridge. 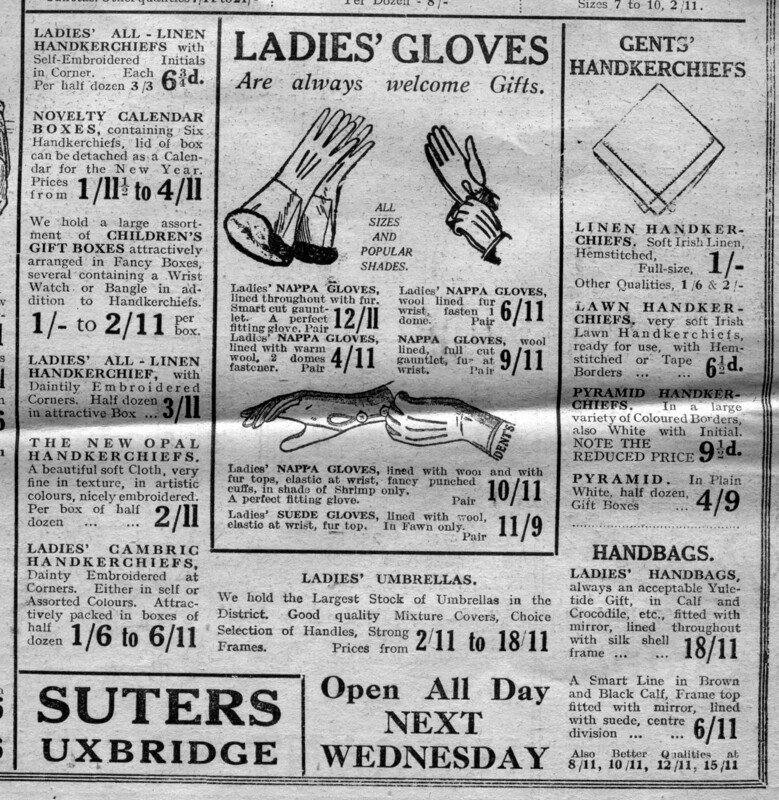 The shop was part of a building known as Waterloo House on the corner of High Street and Windsor Street which according to an article published in The Advertiser and Gazette on May 1, 1936 dates from soon after Wellington's victory in 1815. The same article also described Jessie Jones not as a draper but as having a clog and pattern business and referred to a separate drapery business carried on by an un-named person elsewhere in the building. 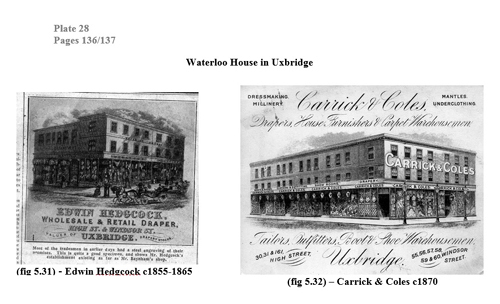 Jessie Jones may even have arrived in Uxbridge before 1846 as another article about Carrick & Coles included in the 1923 Uxbridge Carnival programme dates his shop to 'two years after Queen Victoria came to the throne' (1840). 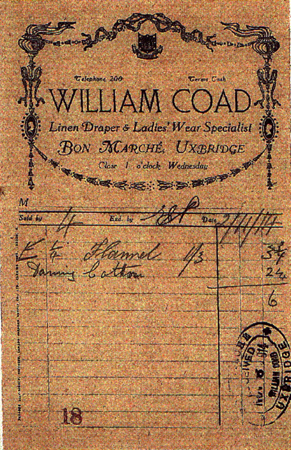 This date tallies with a 'foundation' date of 1839 included in the business card shown in fig 5.33 below. By 1851 there was a drapery shop which was being run by Alfred Smith with the help of a 19 year old apprentice named Joseph Coles from Boxmoor. Following Edwin Hedgcock's death his executors sold the business to Albert William Carrick who also came from Kent - Malling in his case - and the former apprentice Joseph Coles. They may both have been working in the shop at the time Edwin died. 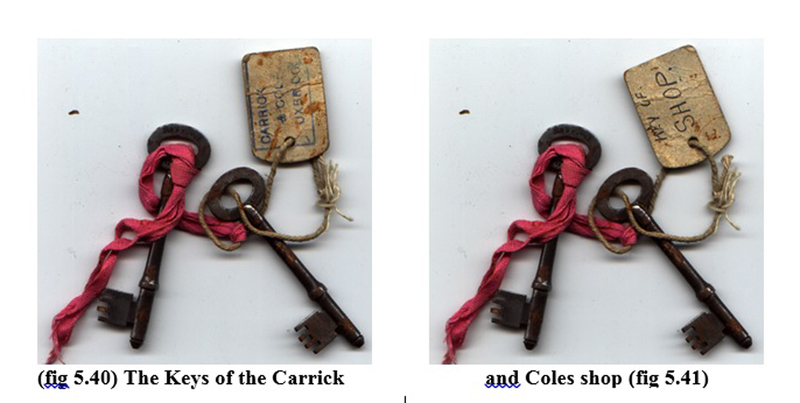 The new firm of Carrick and Coles quickly expanded the premises to take in Nos. 57-59 Windsor Street. 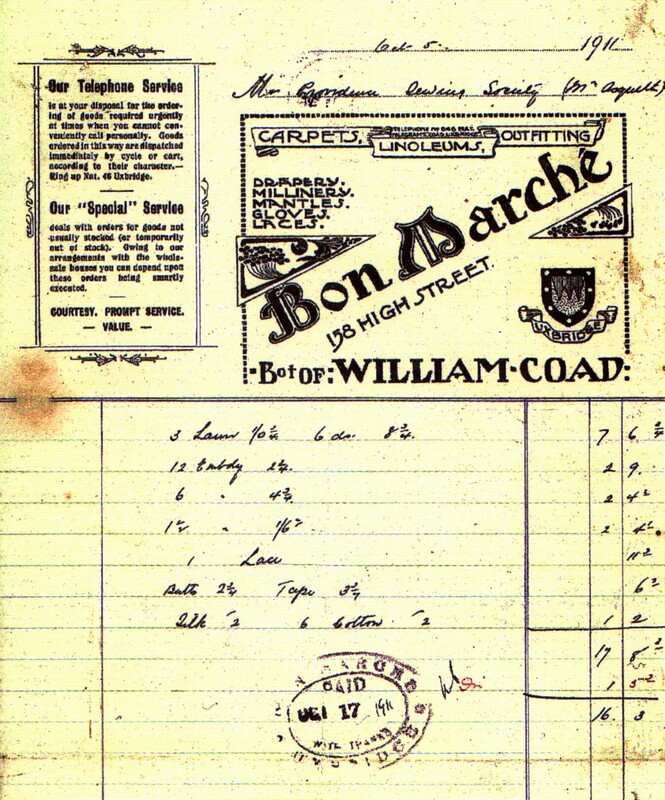 A copy of an early engraved business card preserved by Tony Suter can be seen in (Plate 28 - fig 5.32 above) together with a later card printed after the introduction of the new telephone service and trams which incorporates a photograph (Plate 28 - fig 5.33 above). Assuming that the picture on the earlier engraved card was accurate these two cards and the picture in Plate 28 - fig 5.34 (above), also referred to below, confirm that the shape of the building changed during the Carrick and Coles occupancy and the Uxbridge Historical Society have stated that the whole corner site was redeveloped in 1870-71. 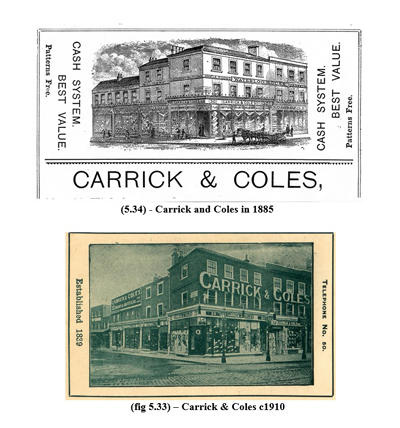 The Carrick and Coles store became the largest shop in Uxbridge with a staff of about 40. An additional partner, James William Aldridge of Amersham, was admitted to the firm in 1880 and established a furniture department on the opposite side of the High Street at No. 161. 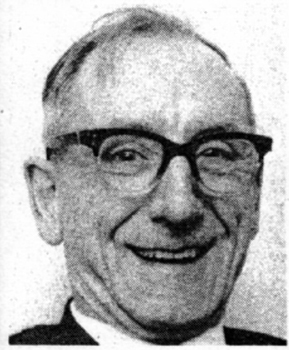 When, in May 1899, Albert Carrick died George Edward Smith joined the partnership and following Joseph Coles' death in March 1906 James Aldridge brought his son Ernest into the firm. 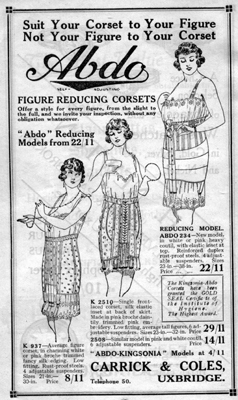 A series of advertisements including one for 'Figure Reducing Corsets' was inserted by Carrick & Coles in the 1923 Uxbridge Carnival programme (fig 5.36 below) but by the following year, 1924, the older partners wished to retire and the business (excluding the separate furniture shop) was offered up for sale and acquired by Suter & Sons. 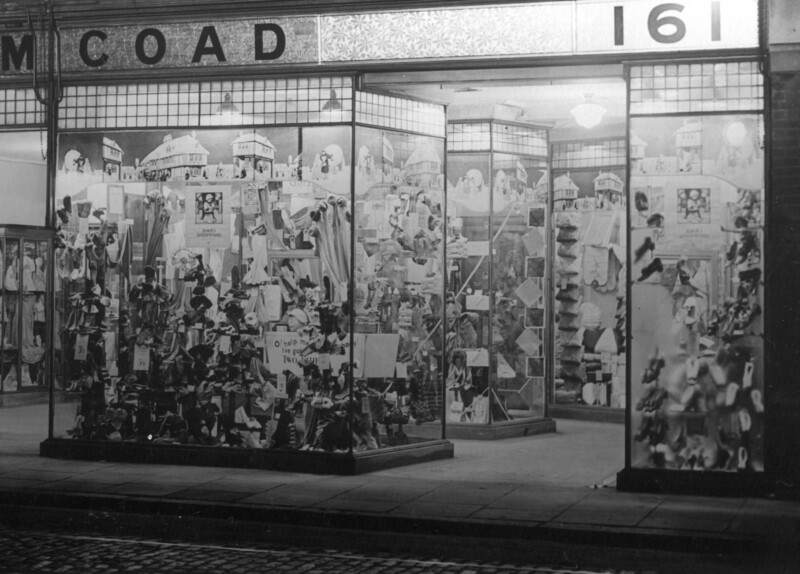 The purchase of created for the Suter and Sons firm a retail business which offered a vastly increased range of goods and services and with outlets in two towns. 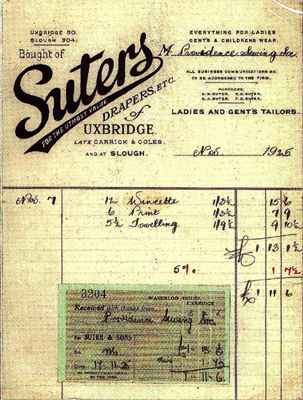 A copy of Suter & Sons, Uxbridge Invoice of November 1925 provides evidence that the business was, immediately, branded 'Suters' (fig 5.37 below) though Suters retained the 'Carrick' name for a range of detached white collars sold in the store after the take-over. 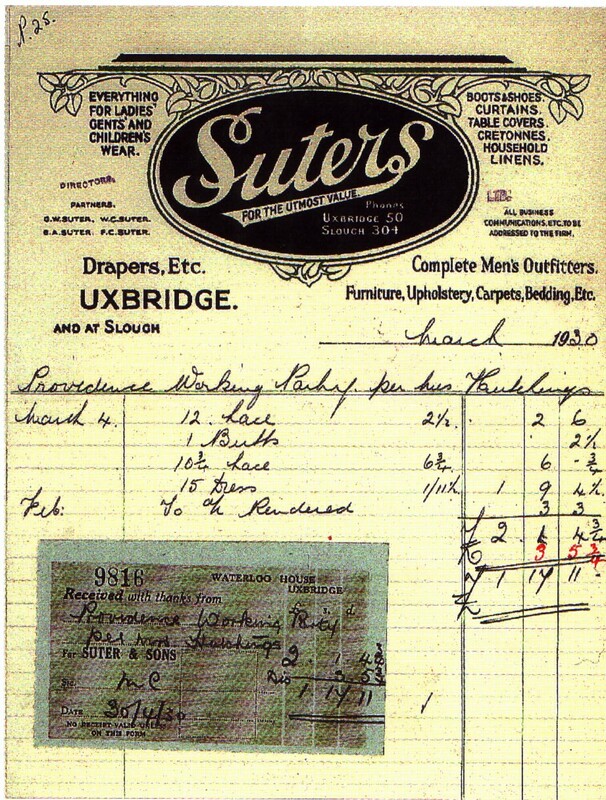 The changes in management needed to deal with the expansion in the Suter & Sons business coincided with the entry of both Arthur and Frank Suter into the partnership. Frank started his life in retailing at the Slough shops and after his marriage he and Vera occupied the living accommodation upstairs. 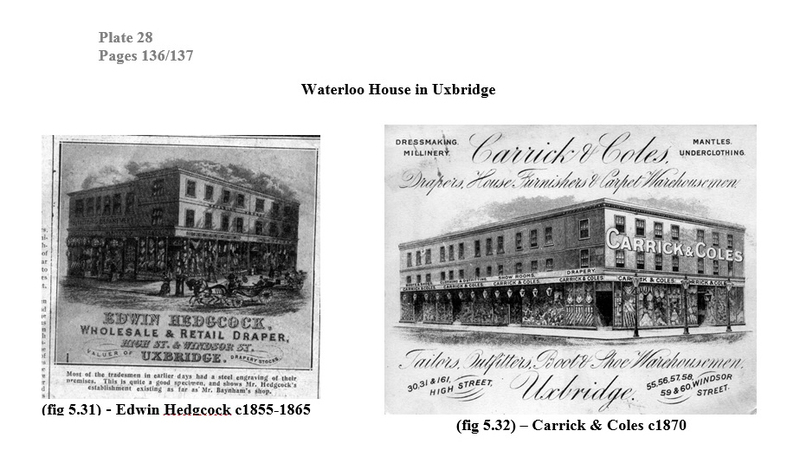 Arthur came over to Uxbridge with Clarence and after Arthur's marriage he and Dorothy took over the rooms above the store in Waterloo House. A photograph (Plate 29 - fig 5.38 below) shows Suters windows lit up on a winter evening with a display of 'Gifts for Xmas'. I always considered you to be my boss, so it is my privilege to write to you on my retirement. 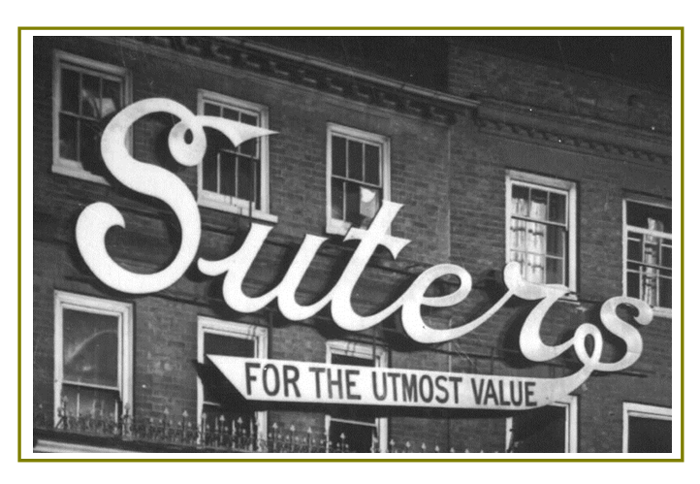 After 47 happy years employed by Suters it was not an easy decision to take that one should retire. However on all counts I think it was wisest. I am moving to Bourne, Lincs April 1st. This will be a new environment, although Lincs is my native county. 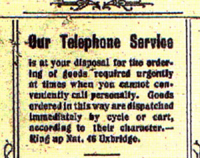 To underline the lack of isolation Uxbridge experienced many of the inconveniences of the 1926 General Strike. 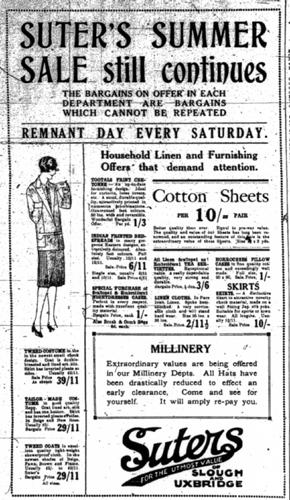 For a time no buses, trains or trams ran, coal was rationed and milk, meat and vegetables all increased in price. 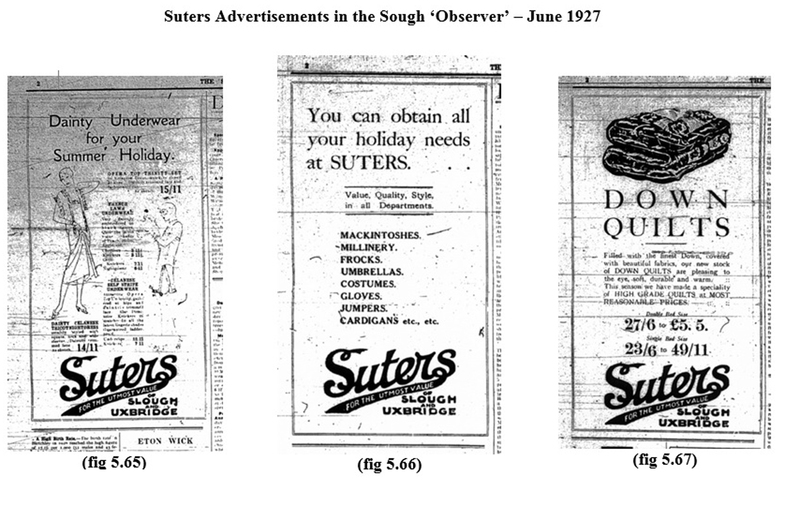 Shopkeepers such as Suters were thoroughly irritated by it all as it occurred in the middle of a 'Buy British Empire Goods' promotional week and sales were hit! 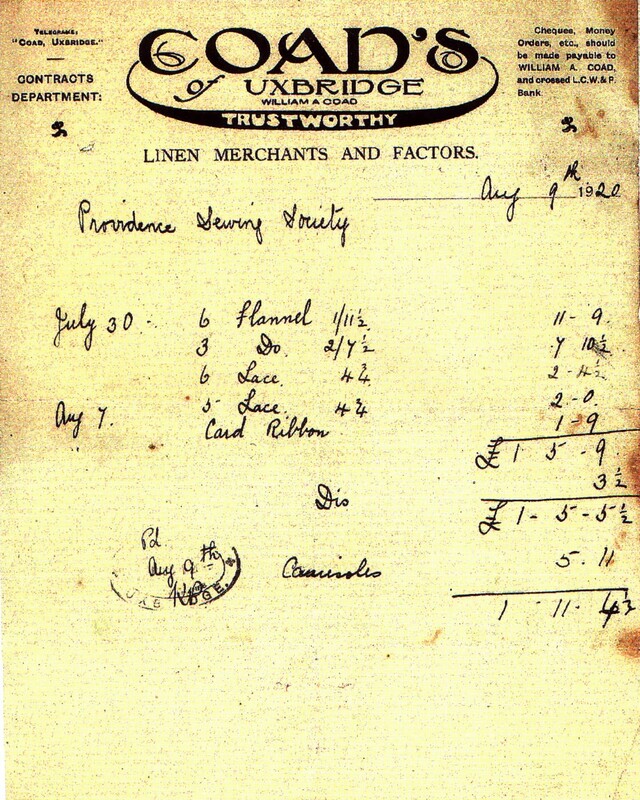 One change which occurred at the end of the '20's' was the reorganisation of local government so as to abolish the Uxbridge Rural District Council and extend the area covered by the Urban District to include the villages of Cowley, Hillingdon, Harefield and Ickenham. The County Council took over responsibility for the Union Workhouse in Hillingdon, closed the workhouse and converted the buildings into Hillingdon Hospital. 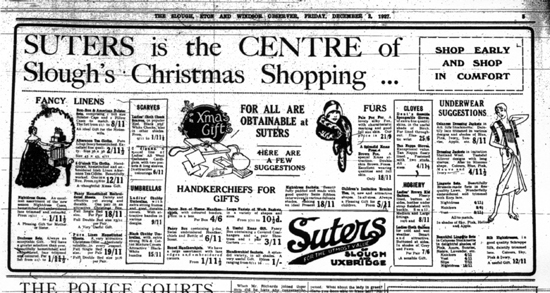 For 'Suters' the growing urbanisation of Uxbridge confirmed the wisdom of the decision to set up in the town. An expansion of the business would be viable if suitable premises could be found - perhaps through the medium of a 'take-over'. 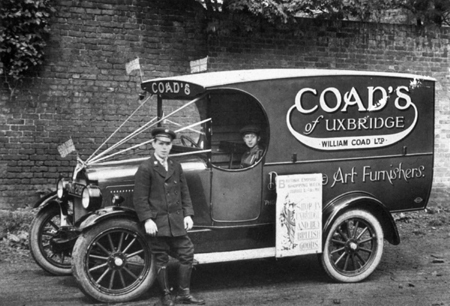 In 1929 they entered into talks with William Coad. 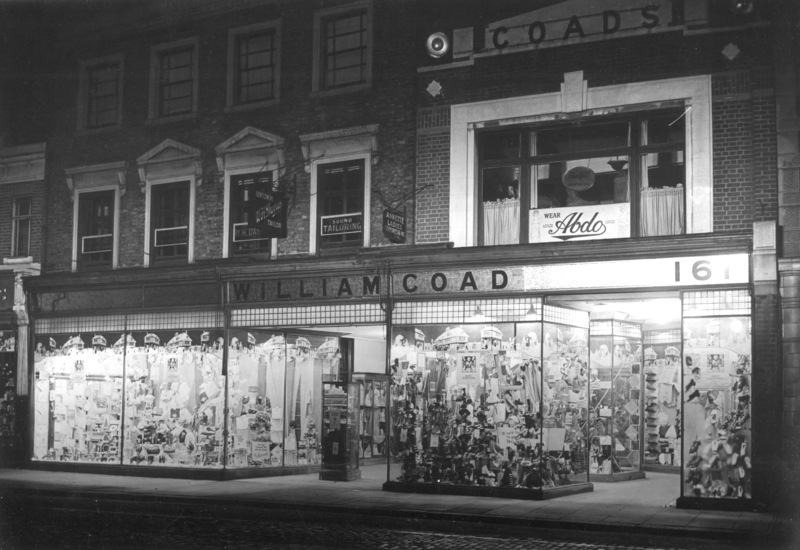 The first William Coad was a native of Callington in Cornwall. 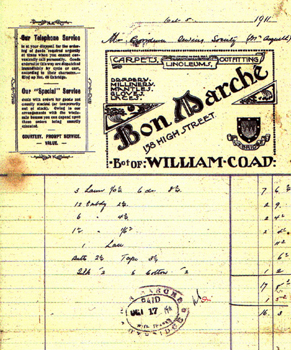 After gaining experience with a London firm, he purchased a shop at 133 High Street, Uxbridge in 1875 previously owned by C. Meeking & Co and called it the "Bon Marche". 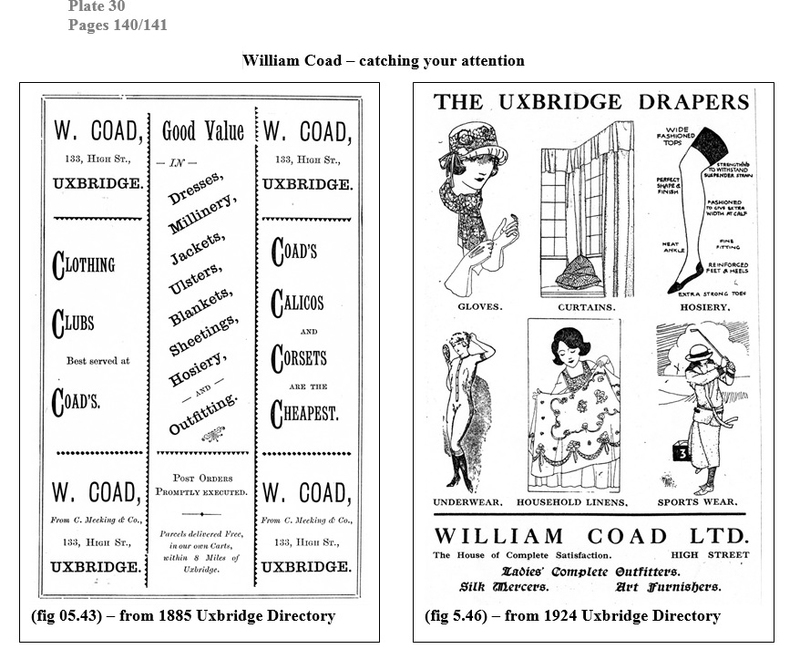 An entry in the 1885 Uxbridge Directory (Plate 30 - fig 5.43 above ) offered "Good Value" in Dresses, Millinery, [mainly women's hats] Jackets, Ulsters, [a loose long overcoat made of heavy cloth and often worn with a belt] Blankets, Sheetings, [any material in the form of or used to make a sheet] Hosiery [socks, stockings and underclothing] and Outfitting. 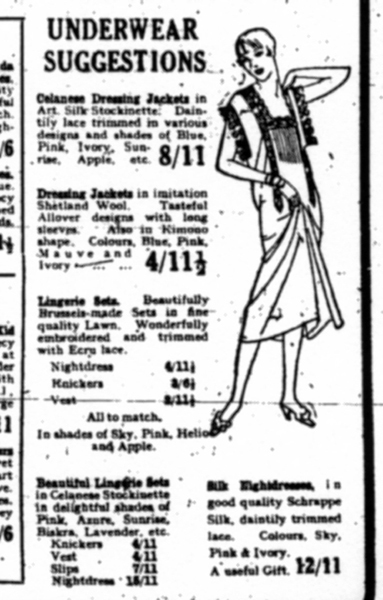 It also coined the catchy slogan "Coad's Calicos and Corsets are the Cheapest"! 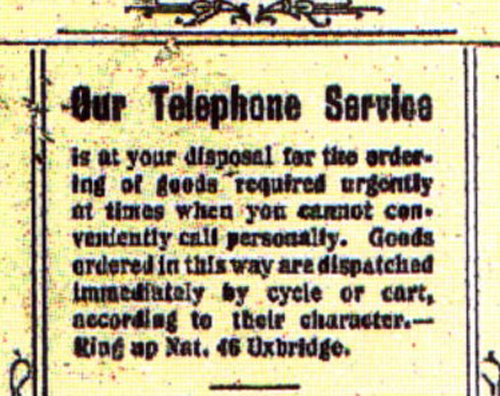 The entry confirmed that "post orders are promptly executed" and "parcels delivered free in our own carts within 8 miles of Uxbridge". In April 1889 the business moved to larger premises at 158 High Street, just across the road from Carrick and Coles and next door but one to the shop at '161' which, for a time, served as the Carrick and Coles furniture department. What do you understand by shop service? When you make a purchase and pay your money are you content that the shopkeeper will take no further interest in you after handing you your change? so much". I want you to know that our interest in your every purchase follows our goods until you have had an opportunity to compare and examine them in your home. If you are then not satisfied, you can ask us to take the goods back and we willingly refund your money on request. S.O.M.B. means "Satisfaction or Money Back". Then there's our Phone Service. 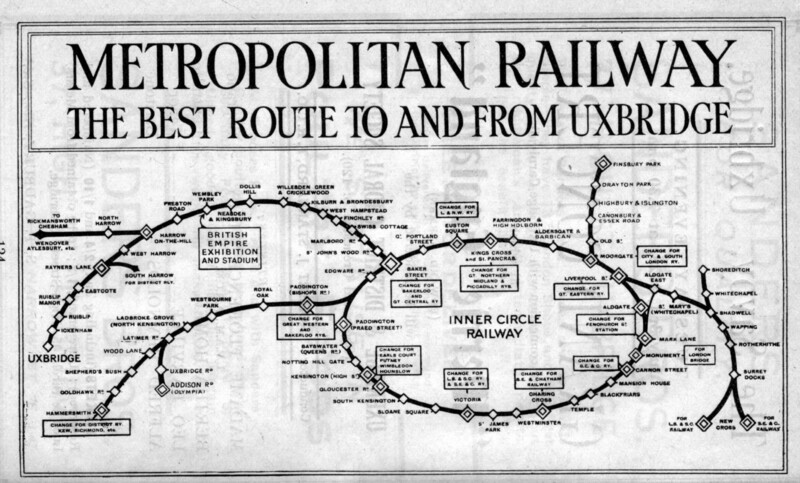 Ring Uxbridge One in any of the emergencies of life. Not only Drapery; we are willing to help if the cat upsets the milk just at teatime for instance. Test the Coad Service …… . It satisfies! 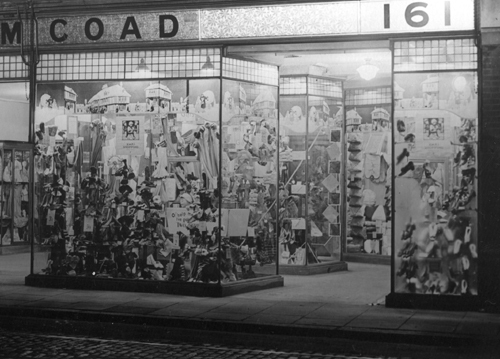 Mr Coad sometimes chalked the initials SOMB on the pavement outside his shop-front. He was rightly proud of the success of his business and the 1923 Uxbridge Carnival brochure had a full page advertisement ( above left fig 5.50) contrasting the then present store with the old shop - at 158 High Street as it was in 1790-a building presumably demolished long before Coads came on the scene. 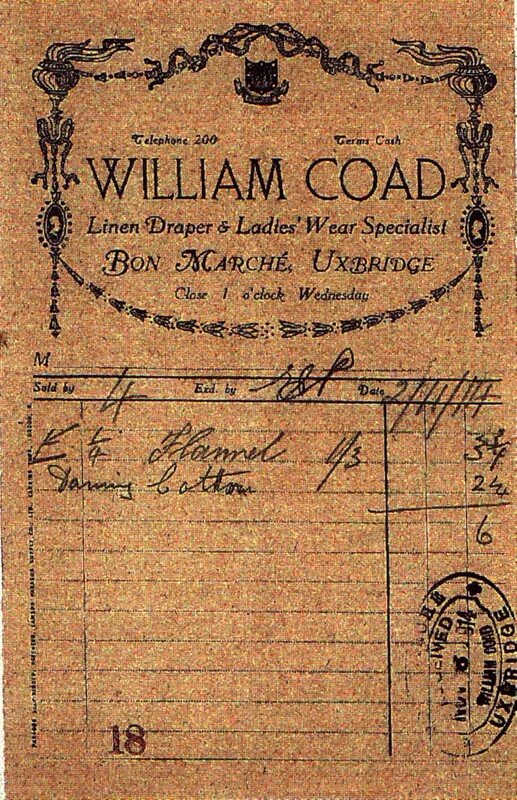 Examples of William Coad invoices issued in 1914 and 1920 can be seen in Plate 31 - figs 5.52 and 53 below. 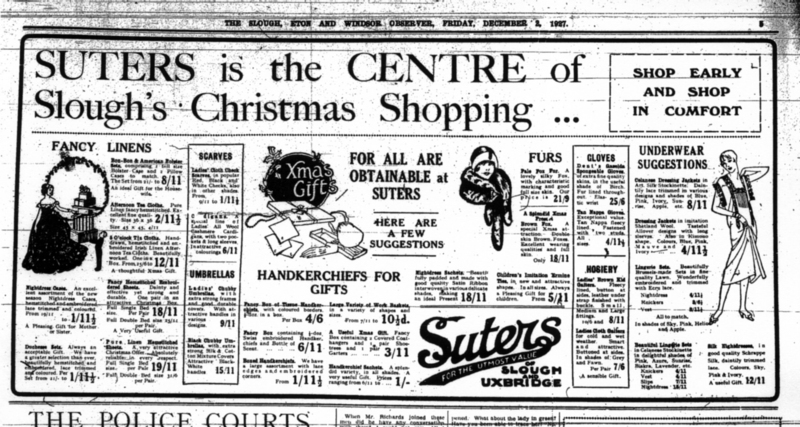 In the Middlesex Advertiser and County Gazette Christmas Supplement for 1927 a centre half page advertisement for William Coad Ltd competed on page 3 with a full page advertisement for Suters of Uxbridge on page 8. 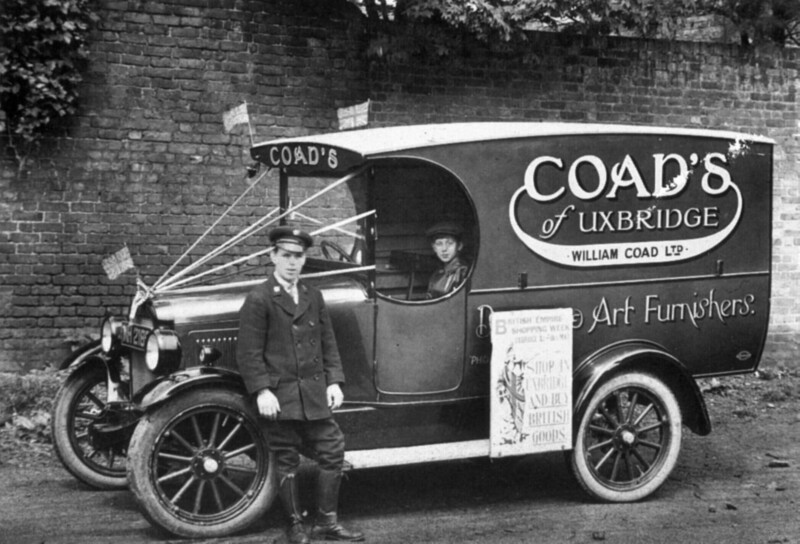 In 1929 William A. Coad decided to move to a similar business in Cambridge. 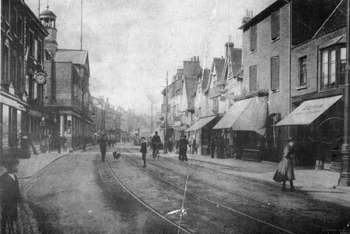 There were, doubtless, discussions with the Suter and Sons on the other side of the High Street which ended in sale though a Wm. 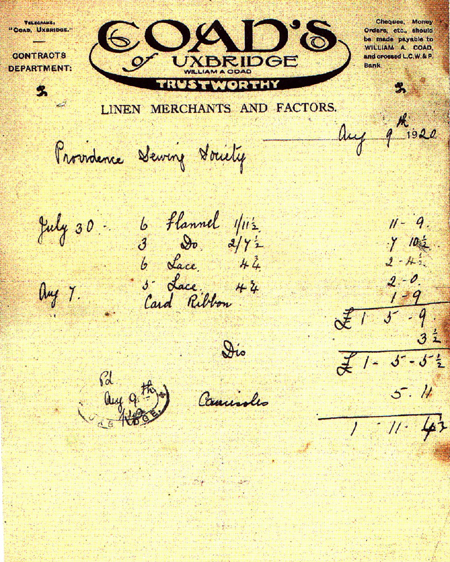 A Coad surviving invoice from 1932 (Plate 31 - fig 5.56 below) and photographs show that the name was retained, indicating the extent of the goodwill built up over the years. 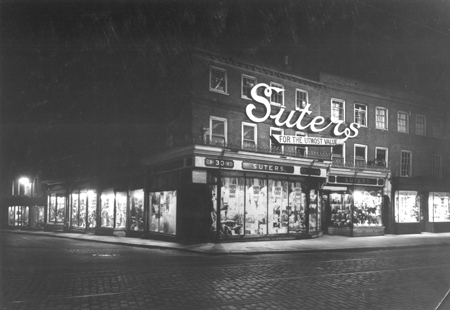 The Suter family had now acquired two distinct stores on either side of the High Street with separate management and a distinct form of invoice. A 'Suters' invoice from 1930 can be seen in Plate 31 - fig 5.57 and this now referred, also, to furniture following the retirement of Ernest Aldridge from the furniture business retained out of the original Carrick & Coles sale. 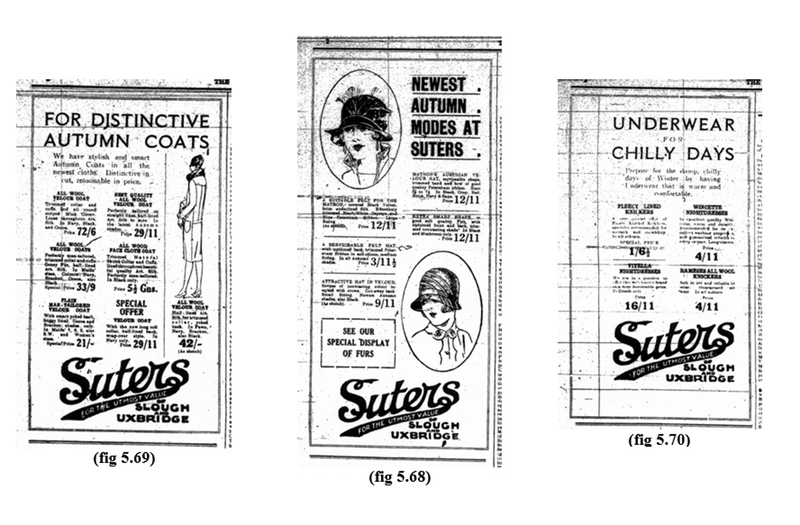 While the principal enlargements to the Suter family business in the later 1920's took place in Uxbridge there remained an intention to expand in Slough as soon as a suitable opportunity arose. 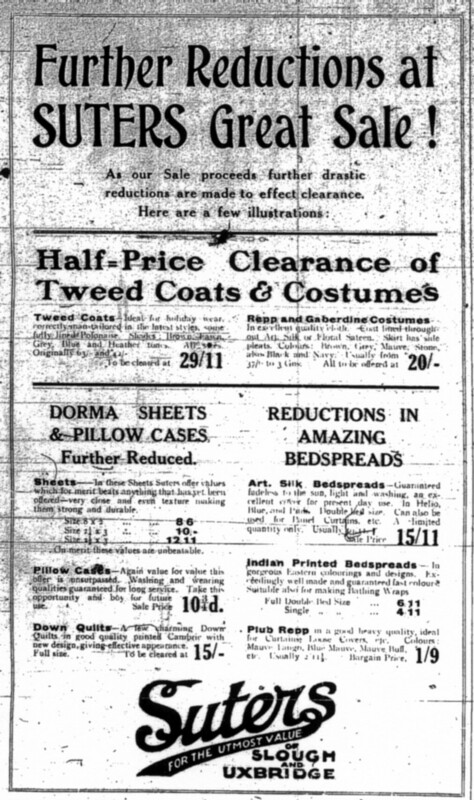 Thus when the Blanchetts Music shop next door to the original ex Andrews & Son shop came on the market in 1927 Suter & Sons bought it and the two adjoining premises were converted to make one larger shop. 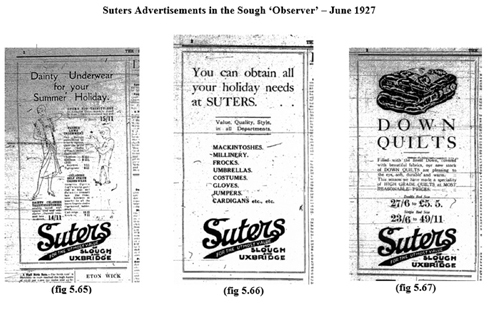 By 1927 Suters was inserting regular display advertisements in the Slough, Eton and Windsor Observer. 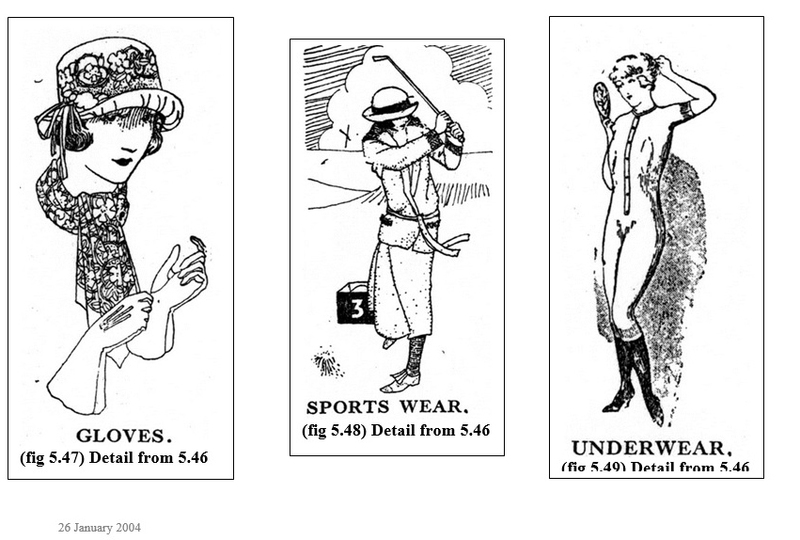 The Summer Sale ran from Thursday June 30th to Monday July 25th and the advertisements placed in in the issues for the Fridays of June 24th, July 8th, July 15th and July 22nd can be seen in Plate 34 - figs 5.60 to 63. Some of the descriptions - for example 'Dainty Celanese Tricot Night-dress' - today read like a foreign language and are not, particularly easy to translate. 'Tricot' was knitted work often by machine and often woollen and was extended to include a close fitting garment. 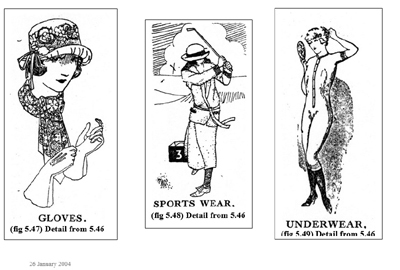 'Celanese' was a proprietary name and included artificial silk made by British Celanese Ltd. 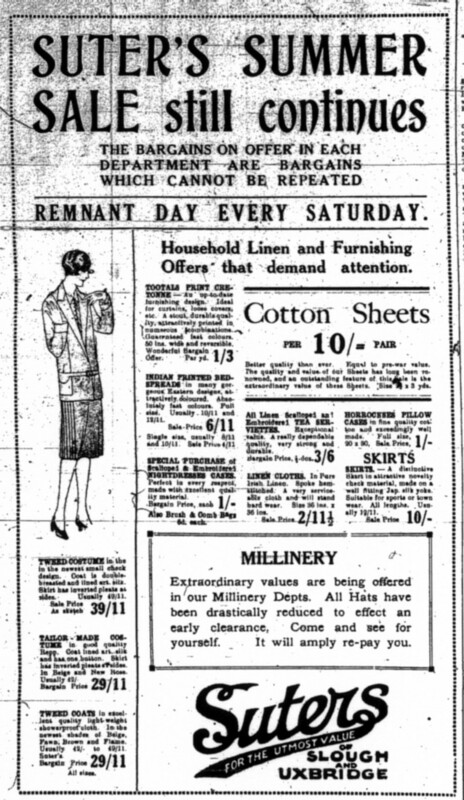 Thus, in an article in the Daily Mail in February 1923: 'Like silk, Celanese is lustrous, with an even more beautiful sheen'.